I seldom put prayer requests on this blog, but this is a special case. It's finals week at her college so she's been gallantly trying to keep up, but keeps fainting from pain. She's been to the emergency room numerous times and received IV fluids, but so far has eluded a diagnosis. There's a possibility of Crohn's Disease or pancreatitis. This past Thursday she had a colonoscopy and endoscopy, and the doctor took 18 biopsies. She came home but the pain was so severe she's been hospitalized again. Last night her mother wrote, "We're heading back to the ER for IV fluids and pain management. She's passing out from the pain in her abdominal region... it's upper left quadrant (pancreas area) and radiating out in a fan-like formation." This morning she added, "We just spent the evening in the emergency room again and they admitted her this time, praise God! As of now they have her pain fairly well managed and other meds on board. I'm happy she's been admitted and that they've ordered a CT scan for tomorrow. I'll send updates as I have info." This kid needs prayer, and a lot of them. Please pray that they are able to diagnose and treat Emily's condition. We are praying for Emily, & for her physicians to be inspired to be able to help her. Just a thought, tho - - Looking at the photo of her with her mother, & looking particularly at Emily's wrist & elbow joints, I wonder if they have ruled out celiac disease? It is one of many that fit the vague intestinal symptoms. We struggled for YEARS with varying diagnoses of irritable bowel, chronic fatigue, etc with my dear husband before our oldest granddaughter was diagnosed at age 9, & thought her world had come to an end because she could not eat anything containing gluten. 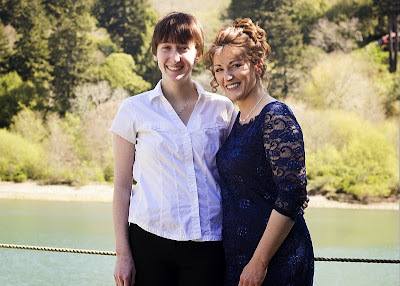 After she had been on the diet for 3 weeks, & was pain free, & largely symptom free, her attitude changed completely, & by then her mother was diagnosed & eventually my husband. That was over 5 years ago, & now there are simple blood tests to rule out celiac, Altho the gold standard is still the biopsy, & it sounds as if Emily has already been through that. I laid hands on her picture. Prayers sent. Oh dear... I will keep her in my prayers. I had a friend who's brother got Crohn's Disease as a child right after receiving the chicken pox vaccine. So I know how horrible it is. It is actually just like Johne's Disease in ruminants. If her tests come back negative please ask her family to consider food allergies. Things like gluten, casein, nuts can wreak havoc on a person without them realizing it is a food allergy. My family and I have had to remove some of these from our diet. They can affect people in all different ways (mentally and physically). sqme here. gluten. dadd treated for decades for colitis. now i'm sure he was gluten sensitive. now i'm diagnosed the rest of the family, daughter and nephew are experiencing wonderful freedom from pain and no pain in joints. dr. sandra cabot. great doctor and has books besides the website. we have her gall bladder book. when the gluten runs rampant for years and you suffer it causes lots of other problems to the entire digestive system, to say nothing of brain fog and painful joints. meanwhile doctors are no help although i think they are waking up to the gluten problem. dr. john la puma is good and you may be able to access his pbs special program on your computer. llok him up, too. research now and ask hospital for gluten free diet . gluten damage can stop you digesting casein and lactose. when gluten damage heals other food can once again be eaten. when you suffer you try to eat a healthy diet and increase the grains and veg. the wheat is meanwhile killing you by degrees. i know this is long but am concerned about the girl. want her to have a happy healthy youth. prayed for her, and for the doctors to have insight. Hopefully they are ruling out a kidney stone too. Oddly enough, stones can radiate pain to areas you just would not expect. Is the hospital she's in a good one? An accurate diagnosis is dependent on the physician ordering the right tests. The one who graduates from med school with an A++ and the one who graduates with a C are both called "Doctor". Her parents should not hesitate to seek a higher level of care if they are not satisfied with the care where they are. I recently had a bout with severe pain in arm,scapular and thoracic area. To make it short, the doc diagnosed Parsonage turner Syndrome which is an auto immune attack on a particular nerve ganglion following - in my case - a rather minor chest cold. This may sound like a long stretch, but the pain was severe and there are nerve ganglion profusely throughout the body - might be worth a mention. As an aside - motrin and Tylenol didn't help me nearly as much as repeating the name of our savior while lying down, and expecting him to help with the situation. I have and will continue to pray for Emily. Keep us updated so we can continue to pray. My prayers for Emily and her family. Dear Lord, may relief and healing come quickly. Oh Lord, hear our prayer for Emily: to restore her from sickness, that she may find healing and transformation from this unknown condition. Only you can do this. Amen. Praying for her and the family! Oh dear Lord this poor child having to deal with all this pain. I have placed your Grand Daughter, Emily on our prayer list with our prayer group. Please keep us updated on Emily. My niece suffered from undiagnosed stomach pain for a long time. They tried everything, including taking out her gall bladder. It turns out it was "leaky gut" syndrome and its associated ills. There is too much info to put down here about how her diet had to change. But she finally is getting some relief. It took over a year for healing to occur. Have they tested for diabetes? My 13-year old niece lost 30 lbs in 2 months until they figured it out, and she was having severe stomach pains. Our prayers are with Emily and her family. Have her family research the GAPS diet. It is miraculous for this sort of symptom set. Celiac is just one of many digestive issues. Lots of folks won't test positive for Celiac, but still have terrible problems and need to radically change their diet. My niece had stomach pain for a few years. Finally they discovered it was "leaky gut," and after a year she is getting some relief. We prayed and prayed and that was the answer. Sounds like Emily has celiac which can cause lots of other problems. I hope she will find her way to better health.